The ability to turn lights on and off from a&nbsp;keypad, controller, or smartphone&nbsp;may not sound all that&nbsp;essential. Once you have that type of system though, it&rsquo;s downright addictive. Attaching technology to everyday tasks can turn the mundane into something super-cool. After all, a smart lighting system is convenient, energy-efficient, and kind of awesome. However, one of our favorite things about smart lighting is how well it plays with other devices in the smart home. Still considering a smart lighting system? 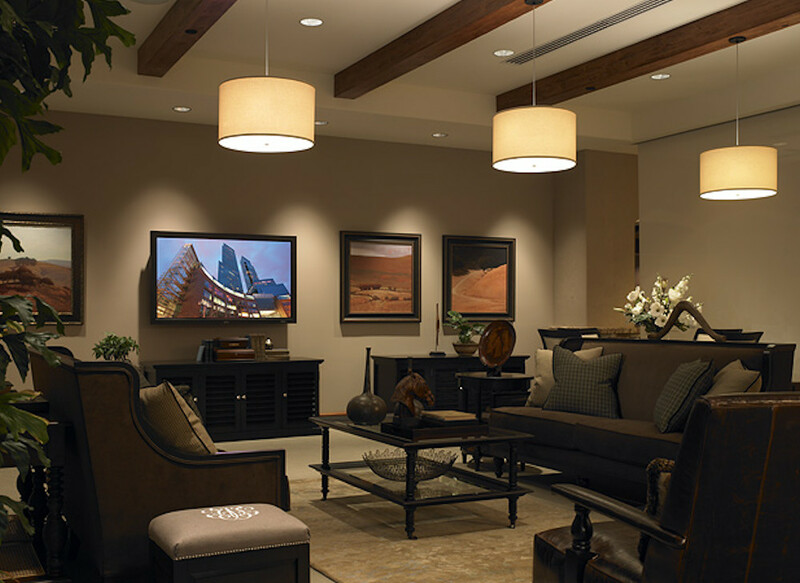 Check out five ways you can tie lighting into other areas of your Electronic House. Motion Sensors. In the Electronic House, sensors are everywhere—and so many of them can be integrated with a smart lighting system. For instance, you can set lights to turn on when a motion sensor is triggered. This won’t just alert you to potential intruders, but can also turn on lights when you pull into a dark driveway. You can even tie those lights into motion detectors, so a pathway will illuminate as you walk from the driveway to the front door. This option would be great for parties, guiding guests to entryways and gathering areas. If you’re worried about having too many lights on at once, consider installing an occupancy sensor, which will turn lights on and off based on whether or not someone is in the room. Home Theater. Of course, all of the best home theater action occurs in the dark. However, you can create the ultimate movie experience by tying lighting into your living room, media room, or dedicated home theater equipment. One button can close automated curtains and shades, crank up the receiver and Blu-ray player, and dim lights. That same button can even trigger pathway lighting so users can get to the snack bar or restroom without causing a stir. Then when you go to shut down the system, one button can pull up lights alerting guests to exits, the bar, or a gaming area. Smoke Detectors. Smoke detectors are a must-have in every house. If you want to add a bit of tech into that essential item, consider tying those detectors into your smart lighting setup. Of course, we’re used to getting an audible alert when there’s an emergency, but lighting can deliver a visual cue as well. The system can be set up to flash lights or even illuminate a safe pathway from the bedrooms to the front door. Door Locks. Who goes there? If you’re worried about home security, consider integrating lighting with those smart door locks. For some, this may seem like a no-brainer. Having the two tied together can turn on the lights whenever you unlock the door, so you never have to enter a dark home. More importantly, it can alert you to when someone else enters the home. When combined, you can set the lighting system to flash or maybe even change colors when someone steps into the foyer. Either way, this combination can make sure you know when someone is coming and going, as well as when. Smartphones. We’re used to smart lighting having an app component for remote control. Believe it or not though, some smart lighting systems can actually sense when you (and your phone) are on your way home, and will react accordingly by turning the lights on or off. This type of automation is achieved by tying your lighting system into your phone’s geofencing features. Geofencing taps into the phone’s GPS system, in order to alert your lighting system when you’re in the area. In order for it to work, you need to make sure you actually have your phone on you. Leaving it at home or at the office isn’t going to be much of a help. However, if you are addicted to carrying that phone, you may never have to enter into a dark driveway or doorway—all without programming, scheduling, or actually touching any buttons.